That's the bottom line message for the B2B C-Suite. Buyers are making decisions based on their criteria, not our criteria or the criteria which we project on them as important. Two articles have come through my inbox recently that demonstrate this from different angles - yet deliver the same insight. First (h/t Army vet and financial writer Patrick Watson who recapped the session in his blog recently) Richard Bina and Carl Marci shared amazing insights from some research they did with Honda in their SXSW session “How Neuroscience Reveals Your Expert Blindness.” Watson's recap is succinct. To test this, they assembled two panels: regular people who were shopping for cars, and executives from Honda dealerships. The test subjects all watched an hour of TV comedy shows including both Honda and other commercials, just like you would at home... except attached to machines measuring brain activity, eye movement, and so on. This let the researchers see exactly what part of the TV screen drew their eyes and which specific words caught their attention. The words and images Honda executives liked had almost zero correlation to those that attracted potential customers. These “experts” homed in on what they knew: the car’s features and financing terms. Consumers, on the other hand, made much more emotional connections. Keep in mind, this happened involuntarily. Their bodily reactions showed these experts didn’t know nearly as much about selling cars as they thought. Oh my....that point is probably worth reiterating. What the executives like "had almost zero correlation to (what) attracted potential customers...(the execs) homed in on what they knew." And these were sharp people that have engaged lots of consultants and top talent over the years. Now, you might ask whether the B2C reactions apply to B2B? They do, and the next article starts off with that question. 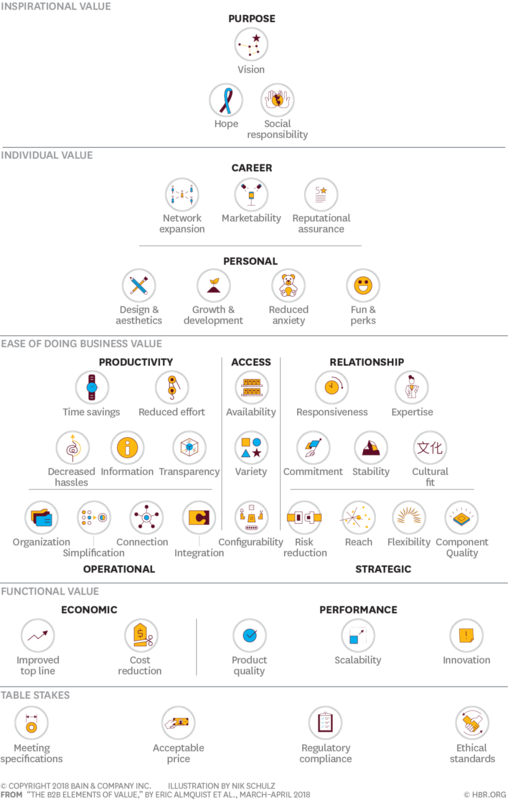 Second (h/t another Army vet and management consultant Ed Brzychcy) Bain consultants Eric Alquist, Jamie Cleghorn, and Lori Sherer collaborated on a Harvard Business Review Article "The B2B Elements of Value." Read the article - it's worth doing so. The bottom line premise is that elements of value upon which B2B buyers base their complex buying decisions are very different than those which the buyers may articulate, and different from those which manufacturers focus on in their marketing and sales. In fact, loyalty and NPS outperformance were closely correlated with excellence in more than six areas of value. And only loosely correlated to price (buyers listed as their top criteria when asked explicitly) and not correlated to table stakes and functional value elements which form the core of most B2B sales & marketing messaging. Implications to you website, blogs, emails, tradeshows, etc. It's very likely that the stuff you talk about is functionally irrelevent to buyers. It's also likely that for all your attempts to differentiate your company/product/service, you're actually making yourself look undifferentiated. All the time spent redesigning and tweaking your website...as well as a lot of other marketing investment is waste. Here's the good news. And it's frankly, fantastic. Actually differentiating your company/product/service and competing becomes much simpler when you understand and accept (that means both intellectually and emotionally - and the latter is much harder for most) these premi. But, it requires being brutally honest, accepting ideas that offend your expert sensibilities and even being vulnerable. That means most can't seize this opportunity.